One of the biggest household expenses for my family of four is groceries. We try to hold our grocery expenses to $100 per week. That includes household cleaning items, personal care products and more. But what can I say? My family likes to eat. My kiddos would love to eat chicken nuggets night after night, but I’m a skilled home cook, and my husband is king of the backyard grill. To eat delicious meals every evening without breaking our household budget, we have to get creative. We’ve all been guilty of wasting food. More than one-third of food produced around the world goes to waste. Some weeks, I’d throw away at least $20 in fresh, wholesome food, like mixed greens or fresh berries. Just picture yourself throwing dollar bills into your trash can as you toss out rotten lettuce or expired canned goods. You bought that food. Now it’s time to make sure you eat it. So before I go grocery shopping, I shop my pantry and fridge. The overall idea is to build your weekly meal plans around items you already have in your refrigerator and pantry. How many times have you come home from the store with a bag full of cheeses — only to realize you already have two bricks waiting for you? I save at least $20 to $30 per week by using things we already have on hand, rather than starting my grocery list from scratch. I buy my groceries on a weekly basis, so I structure my meal plans for seven days. I don’t go to the grocery store on off days. This strategy helps me stick to my grocery budget. 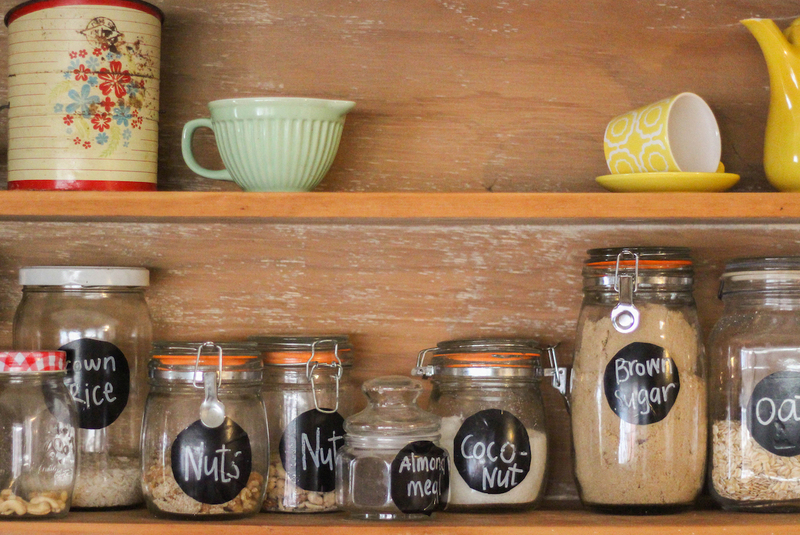 Here’s an item-by-item guide to how I shop my pantry. Start with the produce drawers in your fridge. Fresh fruits and veggies will go bad first, so take note of what you have, and pull out the items you must use during next week’s meal plan. You don’t need to eat hardier veggies like carrots and celery in a single week (think three to four weeks in your veggie drawer), but make sure you’re using all the organic spring mix as soon as possible. Those containers cost at least $3.99 each, and greens will go bad after about five days in your fridge. Again, look for what needs to be eaten in the next week. Always check the use- or freeze-by dates on any meat products. Use or freeze anything from the butcher or meat section within a few days of buying it. Fish should be eaten within 24 hours for optimum freshness. Dairy products last for varying amounts of time. I keep versatile cheeses on hand (like sharp cheddar, mozzarella and Parmesan for pasta dishes) because they keep for at least a month. Plus, you can use them in many different ways. Just keep cheese in an airtight bag to prolong its shelf life. Once you have a sense of what perishables you’ll need to eat this week, move on to the pantry. Find dry goods, such as pasta, rice or beans, that pair well with the contents of your fridge. Then build simple, delicious meals around those combinations. Not bursting with fresh ideas for dinner? Type ingredients into Pinterest to discover new recipes. I also love websites geared toward low-ingredient meals, like Real Simple and Cooking Light. Chicken fajitas are one of my family’s staple pantry meals. My kids love them, and I almost always have all of the ingredients on hand. Toppings: We always have salsa and cheddar or Monterey Jack cheese in our fridge. Occasionally, we’ll have some guacamole, as well. Heat a skillet on medium with some olive oil. Add the chicken, seasoning, and salt and pepper. Brown until cooked through. Remove from the pan. Add the red peppers and onions to the pan, and cook about five to 10 minutes until softened. Heat up the tortilla shells, and top with chicken, the pepper and onion mixture, and your favorite fajita toppings. Other quick ideas include breakfast for dinner. Do you have some pancake mix and apples? Pick up some bacon, and make some awesome apple pancakes. To make it even cheaper, skip the mix. Just whip up a batch of these delicious pancakes. The goal of shopping your fridge and pantry is to physically reduce the number of items you’ll buy at the grocery store during the week. The shorter the list, the lower your total at the checkout. Yes, there will be weeks in which you don’t have much left on hand, and you’ll have to buy more. But if you’re shopping the sales, you should be able to stock up on your staple meal plan items. Cruise your store’s big sale items for the week, and stock up on your pantry staples. Take advantage of buy one, get one offers, and stash away extra products for the following week’s meal plan. If you already have a box of dried pasta, chicken broth and some Parmesan cheese, pick up some fresh veggies, and make a great healthy pasta dish with stuff you already have at home. With this system, you can cut back on your food waste and stick to your grocery budget at the store each week. Your Turn: What are your favorite pantry meals? Christen Gowan is a food blogger living in upstate New York. You can follow along with her recipes and healthy eating meal plans at Christen in the Kitchen.